The High Court has ruled against a council's move to raise the cost of parking permits in a landmark victory for parking campaigners. Mrs Justice Lang ruled that Barnet Council acted unlawfully when it hiked permit costs to generate more money for road maintenance. She rejected claims from the north London council that it had the power to raise extra cash through permits. The council said it would appeal against the decision. In April 2011, Barnet Council more than doubled the charge for a resident's first car permit from £40 to £100. The cost of a permit for second cars was pushed up from £70 to £125, and for a third car the permit charge rose from £70 to £150. The council also quadrupled the cost of daily visitor vouchers from £1 to £4. A group of local residents formed the Barnet CPZ Action group, led by local solicitor David Attfield, in order to challenge the increased costs. They argued that the price hikes were not needed to cover the cost of running the permit scheme, which they said was already in surplus. The group also said the price increases were "unfairly" loaded on a small proportion of the borough, claiming that just 10% of Barnet residents live in a CPZ. The council said the additional income was intended to meet projected expenditure for road maintenance and improvements, concessionary fares and other road transport costs. But at London's High Court on Monday, Mrs Justice Lang said that the 1984 Road Traffic Regulation Act "is not a fiscal measure and does not authorise the authority to use its powers to charge local residents for parking in order to raise surplus revenue for other transport purposes". She ordered the council to repay Mr Attfield's parking charges, plus his legal costs. The move paves the way for other residents to seek repayment for their charges. 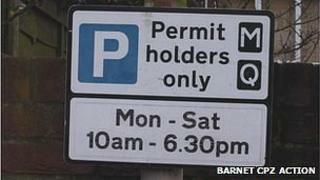 Had Barnet won, local councils across the country would have found themselves with sweeping powers to use parking as a revenue-raising service. Barnet CPZ Action took to Twitter to say a "big thank you" to its supporters. The group added: "Such great news for the country." Professor Stephen Glaister, director of the RAC Foundation, said: "This is fantastic news for drivers. This decision should never have been in any doubt. The law is explicit - parking charges are about managing congestion, not raising revenue. "If there is a surplus collected then there are strict rules on what it can be used for. The question is: why did Barnet ever think it had an arguable case to pick on one group of residents to shoulder an additional tax?" The leader of Barnet Council, Councillor Richard Cornelius, said that the council's price and spending is "very much in line with other London boroughs". He said: "I very much believe that our spending of the income from our parking account on items such as road maintenance and transport services is entirely within the scope of the special parking account under the Road Traffic Act." "With that in mind I don't think we have any alternative but to look to appeal this decision." He conceded however that after five years of a price freeze, the council increased the price of permits "too abruptly and rather charmlessly". Mr Cornelius added: "I will make sure that doesn't happen again".